Maximum RV Length: 42 ft. Within an easy drive from anywhere in Southern California, Catalina Spa features two natural, hot and therapeutic mineral water pools and spas, as well as close proximity to the exciting life of Palm Springs. Catalina Spa specializes as a family resort, offering adult and family-oriented activities and recreation. Elevation: 1,100 ft. - 1,300 ft. Rigs 33 ft. and larger are assigned 50 amp sites. Guests must be checked in no later than 5pm. Earlier arrival is recommended to avoid being turned away. 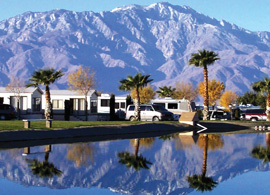 Our resort is between Palm Springs and Desert Hot Springs. From Phoenix, take I-10 west, or from Los Angeles, take I-10 east, to Palm Drive northbound. Turn right at Dillon Rd and watch for our signs at Corkill Rd southbound. Catalina Spa & RV Resort is .7 miles on the left hand side of Corkill Rd. Receive 50% off nightly rate. Maximum 2 weeks at discounted rate. 30 days in between visits.